So, here we go on our little journey to find out every ones "Ouch, that ish is effing burning mah tongue" threshold. Some can hack the heat and some can't. So what happens when peeps from different ends of the spectrum dine together? Who takes the back seat in their spice enjoyment? What restaurants and recipes can you relay to us so that we may discover that Shangri La where the uber hot and uber mild can coexist, where everyone is a winner, where as written in the prophecy that when the three suns meet a shard will be replaced in the Dark Crystal Chili to restore harmony and balance in the Spice Universe ......... You get the idea. 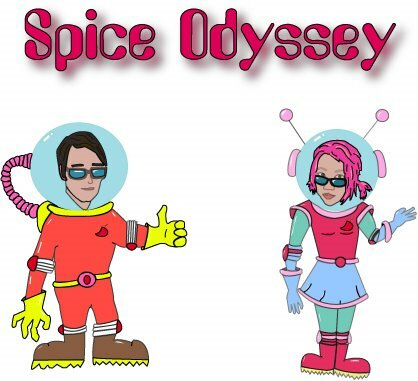 Anyway, you might feel more comfortable in one of the Spice Odyssey t-shirts you'll see below. The Spice must flow....................Just not from our bums.